Haddadi, Maryam, Ahmadi, Maliheh, Keyvanpour, Mohammad Reza, Riahi, Noushin. (1396). Using Curve Fitting in Error Correcting Output Codes. مجله علمی-پژوهشی رایانش نرم و فناوری اطلاعات, 5(1), 62-69. Maryam Haddadi; Maliheh Ahmadi; Mohammad Reza Keyvanpour; Noushin Riahi. "Using Curve Fitting in Error Correcting Output Codes". مجله علمی-پژوهشی رایانش نرم و فناوری اطلاعات, 5, 1, 1396, 62-69. Haddadi, Maryam, Ahmadi, Maliheh, Keyvanpour, Mohammad Reza, Riahi, Noushin. (1396). 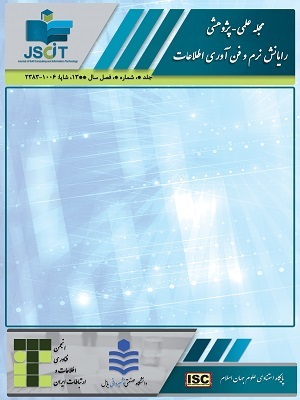 'Using Curve Fitting in Error Correcting Output Codes', مجله علمی-پژوهشی رایانش نرم و فناوری اطلاعات, 5(1), pp. 62-69. Haddadi, Maryam, Ahmadi, Maliheh, Keyvanpour, Mohammad Reza, Riahi, Noushin. Using Curve Fitting in Error Correcting Output Codes. مجله علمی-پژوهشی رایانش نرم و فناوری اطلاعات, 1396; 5(1): 62-69. The Error Correcting Output Codes (ECOC) represent any number of the binary classifiers to model the multiclass problems successfully. In this paper, we have used Curve Fitting as a binary classifier in ECOC algorithm to solve multiclass classification problems. Curve Fitting is a classifier based on a nonlinear decision boundary that separates two pattern classes by the curves of the best fit, and arriving at optimal boundary points between two classes. Since we need a coding and a decoding strategy to design an ECOC system, this paper gives five coding and eight decoding strategies of ECOC and compares the results of Curve Fitting with Adaboost classification and Nearest Mean Classifier (NMC). This evaluation has been performed on different data sets of UCI machine learning repository. The results indicate that One-versus-one, ECOC-ONE coding and LAP, BDEN decoding having the best results in contrast with another coding and decoding strategies and Curve Fitting is a good base classifier in ECOC, also it is comparable with the other ECOC approaches. V. Vapnik, The nature of statistical learning theory, Springer-Verlag, 1995. J. Friedman, T. Hastie, R. Tibshirani, Additive logistic regression: a statistical view of boosting, The Annals of Statistics vol. 38 (2) 1998, pp. 337–374. L. Breiman, J. Friedman, R. Olshen, C. Stone, Classification and Regression Trees, Wadsworth, 1984. R.A. Jacobs, M.I. Jordan, S.E. Nowlan, G.E. Hinton, Adaptive mixture of experts, Neural Computation 3, 1991, pp 79–87. T. G. Dietterich and G. Bakiri, Solving multi class learning problems via error correcting output codes, J. of Artificial Intelligence Research 2, 1995, pp263-286. S. Escalera, O. Pujol, and P. Radeva. Boosted landmarks of contextual descriptors and forest-ecoc: A novel framework to detect and classify objects in clutter scenes. PatternRecognition Letters, vol. 28, no. 13, 2007, pp. 1759–1768. E. Allwein, R. Schapire, Y. Singer, Reducing multi class to binary: A unifying approach for margin classifiers, Journal of Machine Learning Research vol. 1, 2002, pp. 113–141. T.Windeatt, R. Ghaderi, Coding and decoding for multiclass learning problems, Information Fusion vol. 4, no. 1, 2003, pp. 11–21. T. Dietterich, E. Kong, Error-correcting output codes corrects bias and variance, in: P. of the 21th ICML (Ed. ), S. Prieditis and S. Russell, 1995, pp. 313–321. Thomas G. Dietterich, GhulumBakiriSolvingMulti class Learning Problems via Error-Correcting Output Codes, Journal of Arti_cial Intelligence Research 2, 1995, pp. 263,286. Sergio Escalera, OriolPujol, and PetiaRadeva, Error-Correcting Output Coding for Chagasic Patients Characterization, 19th International Conference on Pattern Recognition, vol. 17, 2008, pp. 1-4. Sergio Escalera, David M.J. Tax, OriolPujol, PetiaRadeva, and Robert P.W. Duin, Multiclass Classification in Image Analysis via Error-Correcting Output Codes, H. Kwa´snicka& L.C. Jain (Eds. ): Innovations in Intell. Image Analysis, SCI 339, springerlink.com _c Springer-Verlag Berlin Heidelberg, 2011, pp. 7–29. Ganjeshvaidyanathan.s.DR.BibbasKar,DR.N.Kumaravel,A Curve Fitting approach to separation of nonlinear separable pattern classes, applied to chromosome classification, IEEE international conference on signal processing, 2008. C James; Truncating criteria for polynomial Curve Fitting ; 1971, J.Phys.D:Appl.Phys.4, pp 357-363. Draper, N. R; smith,H. Applied regression Analysis; 3rdedition.Johnwiley& Sons, 1998. White; Micromaths: Cubic Spline Curve Fitting, mathematics applications, 1986, pp 39-45. E. Allwein, R. Schapire, Y. Singer, Reducing multi class to binary: A unifying approach for margin classifiers, Journal of Machine Learning Research, vol. 1, 2002, pp. 113–141. T. Hastie, R. Tibshirani, Classification by pairwise grouping, The annals of statistics, vol. 26, no. 5, 1998, pp. 451–471. T. Dietterich, G. Bakiri, Error-correcting output codes: A general method for improving multi class inductive learning programs, in: A. Press (Ed. ), 9th CAI, 1991, pp. 572–577. A Asuncion and D.J Newman UCI machine learning repository. http://www.ics.uci.edu/~mlearn/MLRepository.html, 2007, University of California, Irvine,school of Information and Computer Science. A.Rocha, S. Goldenstein, Multiclass from Binary: Expanding One-vs-All, One-vs-One and ECOC-based Approaches, IEEE Transaction on neural networks and learning system, 2013, pp. 1757–1772. Martine Pelikan, David E. Goldberg, and Erick Cantu-Pez. Learning machines, In McGraw-Hill, 1965. E. Allwein, R. schapire, and Y, Singer, Reducing multi class to binary: A unifying approach for margine classifiers, volume 1, 2002, pp, 113-141. O. PujolM.Rosales, and P.Radeva. Intravascular ultrasound images vessel characterization using Adaboost, Functional Imaging and Modeling of the Heart, 2003, pp. 242-251.